On 4th July 2015, the Saudi led coalition airstrikes hit a gas station, a hotel, a restaurant and a busy market place in the district of Harad in Yemen, injuring at killing at least 65 people, including at least 3 children, and injuring 105 more. At about 10 p.m. on July 4, coalition aircraft bombed the marketplace in the middle of the village of Muthalith [triangle] Ahim, about 20 kilometers south of the Saudi border in Yemen’s northwest. Because the attack occurred during the holy month of Ramadan, the area was crowded with people breaking their fast in restaurants late in the evening. The airstrike destroyed at least six buildings along the main road of the village, including a four-story building housing the Sanaa Restaurant, a small shop and hotel, and a water truck and car parked outside. Human Rights Watch examined the site on July 24 and spoke to the staff of four hospitals that received the dead and wounded, as well as officials with the Ministry of Human Rights. The attack killed at least 65 people, including at least six African migrants and three children, and wounded at least 105. Forty of the wounded who were sent to al-Jumhouri Hospital in Hajja were suffering from metal fragment injuries, and most needed surgery, according to a nurse who was on call that night. Muhammad Hassan, 35, a waiter at Sanaa Restaurant who was wounded in the attack, told Human Rights Watch that several hours earlier, there had been a strike on a gas station about two kilometers (1.2 miles) further north. Then, about an hour later, there was a strike on a football field about one kilometer (0.6 miles) away, and at the same time another strike on an empty building about two kilometers away. He said he had heard from some people in town that the Houthis were using the empty building to store weapons. None of the other interviewees raised this allegation with Human Rights Watch. "I was outside in the alley beside the restaurant taking out the trash when the strike hit. I saw fire and smelled gunpowder. The pressure of the explosion threw me back about 10 meters into a pile of trash bags. I tasted blood, and felt a pain in my chest, and then I lost consciousness. I woke up here at the Hajja hospital, only to find out that 13 waiters from the restaurant who worked with me were killed in the explosion." Muhammad’s doctor said he had metal fragment injuries to his left shoulder, chest, and right leg. After multiple surgeries, Muhammad had yet to regain movement in his left arm. "I counted 45 bodies intact, many lying under the stalls of the qat sellers. I saw other bodies that had been shattered to bits, some already stiff. People all around me were shouting. I saw the driver of the water truck, a friend of mine, and his assistant both dead in the vehicle, as it was burning. I witnessed a terrible thing, a very scary scene." "We got news of the strike about 30 minutes after it happened, but we waited two hours before leaving because we were scared the coalition might target us on the road. We finally left at 12:30 a.m. While on the road we passed a truck carrying 23 of the victims—we stopped the driver to see if we should help the people on the truck or keep driving. It was piled high with bodies, heads open and bleeding. Two of the people in the truck were already dead, another 10 were near death. We kept on driving and made it to the Bani Hassan medical center [in Hajja, about 30 kilometers (19 miles) south of Muthalith Ahim], where most of the wounded had been brought. I will never forget the scene—there were bodies all over the floor." "When I arrived, there were still many bodies—most of their faces looked normal, like they were sleeping, just with some marks from metal fragments. In front of Sanaa Restaurant, I saw one man with his backbone sticking out of his neck. By the qat market, I saw dozens of bodies, charred, some headless, others without legs. I saw 10 bodies inside the Hadramawt Restaurant, many missing their arms and legs, all killed while they were in the middle of having their dinner. The arm of one man was still attached to the large water cooler by the entrance. A water truck had exploded, and I saw the head of the driver hanging off the end of what was left of the truck." It is not clear if any Houthi or allied fighters were killed in the attack. Al-Mashwali, the truck driver, told Human Rights Watch there had been a Houthi checkpoint about 50 meters (55 yards) from where the strike hit, manned by 10 to 12 Houthi fighters. Witnesses who spoke to Human Rights Watch said the strike did not damage the checkpoint. Even if the checkpoint, a legitimate military objective, was the target of the attack, the coalition should conduct an investigation to determine if all feasible precautions were taken to minimize the harm to civilians, and whether the attack as carried out was unlawfully indiscriminate or disproportionate. "on 4 July, two air strikes hit a busy market in Beni Hassan in Hajjah province, in an area known as the Aahem triangle. The first explosion hit a cooking-gas station at about 8.30pm. The second, half an hour later, fell in the heart of a crowded market as well as two neighbouring restaurants and a hotel." SANA'A, YEMEN/NEW YORK—Medical facilities supported by Doctors Without Borders/Médecins Sans Frontières (MSF) have received hundreds of people wounded in airstrikes and ground shelling across Yemen in recent days, and MSF teams have treated scores of people in several locations, including victims of a July 4 attack on a crowded marketplace in Harad District. An MSF team treated more than 67 injured persons in Beni Hassan, in northwestern Yemen's Harad District, following a series of airstrikes targeting a busy marketplace after people broke Ramadan's fast on the night of July 4. An estimated 20 people were killed in the attack in the market, and the MSF team recovered nine dead bodies among the debris the following day. An elderly injured man was also rescued and transferred to Beni Hassan health center, where MSF has provided support since May 2015. 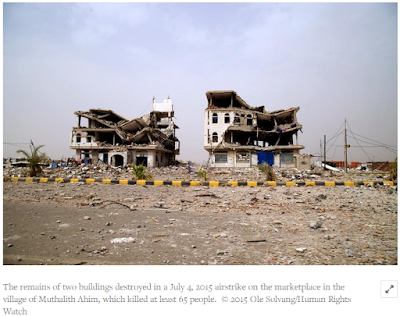 "It is unacceptable that airstrikes take place in highly concentrated civilian areas where people are gathering and going about their daily lives, especially at a time such as Ramadan," said Colette Gadenne, MSF head of mission in Yemen. The attack on the market in Beni Hassan, called Aahem triangle, first hit a cooking-gas station at about 8:30 p.m. At about 9:00 p.m., a second attack hit the heart of the crowded market, as well as two restaurants and a hotel. The MSF team was called to Beni Hassan an hour later, when private cars and public transport vehicles were already taking dozens of injured people to the health center. The team stabilized the wounded patients and referred three to the main hospitals of the region, al Jumhuri (Hajjah City) and al Olafi and al Thawara hospitals (Hodeida City). MSF donated war-wounded kits for 100 persons to al Jumhuri hospital, which received over 40 referrals in total, and also provided fuel and ambulances. Medical teams were quickly overwhelmed by the number of wounded persons and the severity of their injuries. "It has been terrible. We could never have imagined that we could receive so many severely injured people at one time in a small health center like Beni Hassan," said one member of the MSF team, Dr. Ammar. "The whole team is shocked by what they have seen, especially since it happened to people enjoying an evening in Ramadan." * The rest of the list is available with Abs Clinic and Jumhouri Hospital in Hajja City.